First up, Heart-2-Heart. 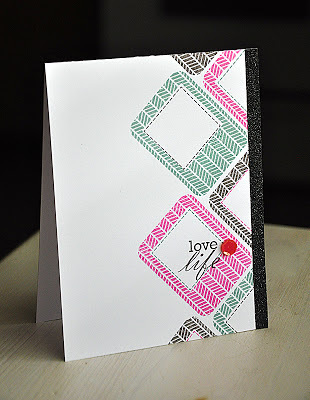 To start, I attached a strip of American Crafts glitter tape to the bottom of the card base. Loving this stuff! Such an easy and fast way to add a touch of glitter without the mess. I then die cut the adorable stems from limeade ice cardstock, staggered them along the bottom edge and trimmed off the access. Here's A Tip: Keep in mind the placement of the flowers on top, it looks super cool when they are sort of randomly placed verses all in a uniform row. it's a bit unexpected that way. 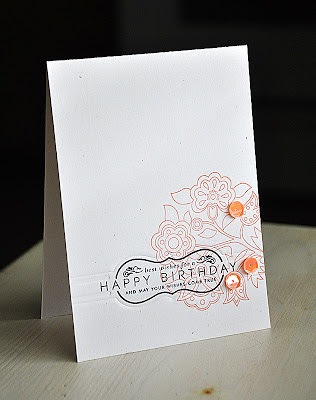 Stamped the flower tops and finished the card off with a few pretty sequins to match. Framed Out #12 includes my favorite frame image of the entire series! Using the frame, I stamped a fun angled edge in a color combo of raspberry fizz, ocean tides and smokey shadow. Then embellished with a thin strip of glitter tape and a dark pink sequin. Last but not least... Everyday Photo Finishers. I pulled out my a Fancy Folk Art for this one and stamped the main outline image in melon berry ink. I then impressed one of the Photo Finishers Stripes Dies across the card front, it's truly a nice and subtle effect. Then stamped the sentiment within the impression. Finished the card off with a few peachy sequins. P.S. You have probably noticed my new found love with the sequin. Ever since my sequin order came in I've been hooked! Check them out here, I just love the color selection! I love these projects Maile. 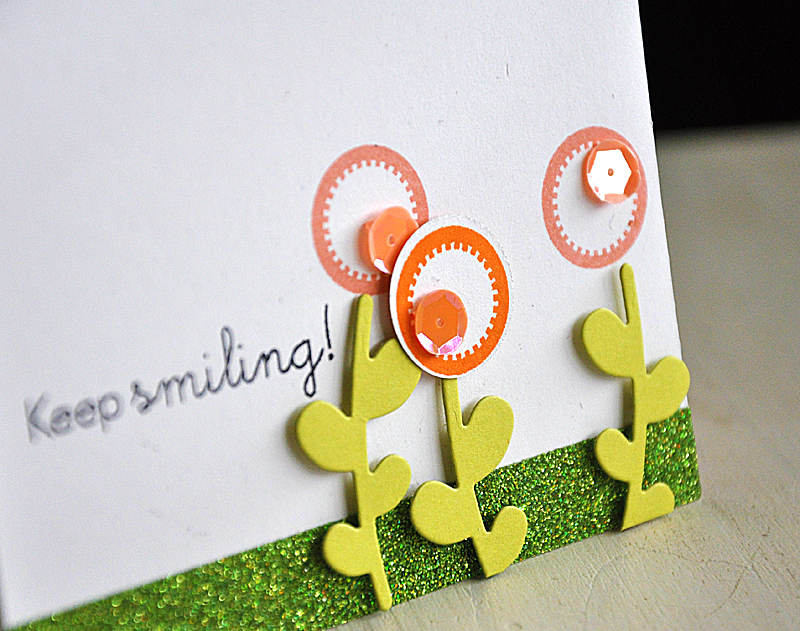 I love the green glitter on the bottom of the first card. It's such a great "grounding" for the flowers. And I love the sequins on the flowers. Simply beautiful! The 2nd card is SO SO SO neat! 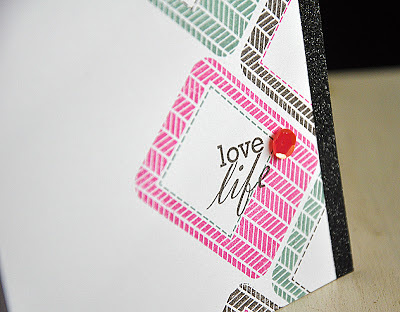 I LOVE the colors...they are so classy and I love that strip of black glitter. The 3rd card is simply lovely! Such pretty soft colors! Love the black sentiment. And by the way, thanks for posting photos from CHA. I loved seeing the photos you posted! Maybe someday I'll be able to go. :) Have a great day Maile! You are so talented! I love the idea of embellishing with sequins. i don't think I have seen that before and still a lot of bang but not a lot of bulk! 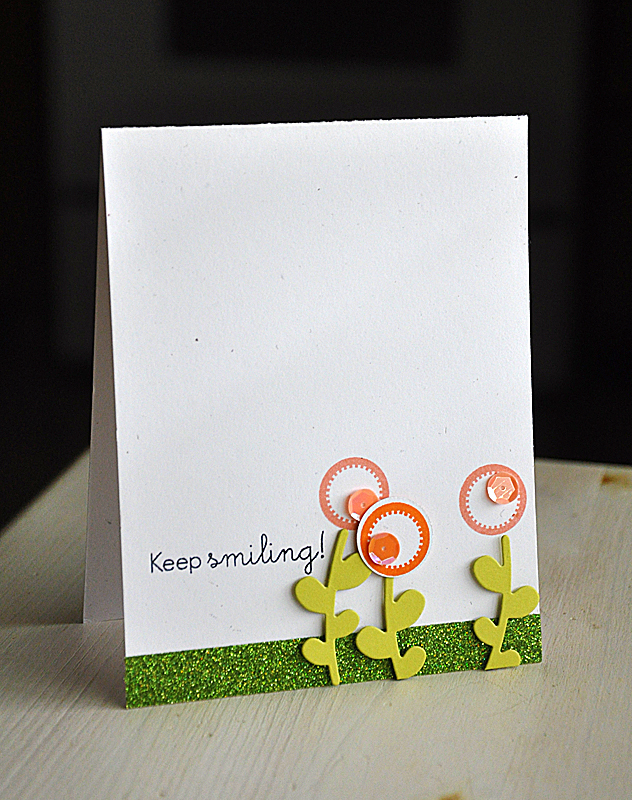 Hi Maile, I'm Sarah from Making-Handmade-Cards.com. Stunning projects there, Maile! 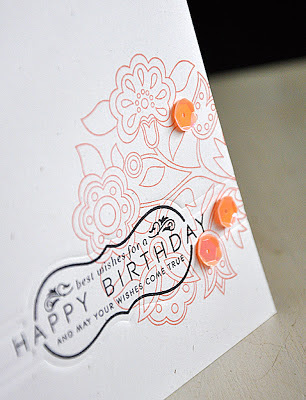 I love the use of arrows in a card and I think what you did is just awesome!